Today, June 7th 2013 is the Solemnity of the Most Sacred Heart of Jesus. This feast is celebrated on the 19th day after Pentecost Sunday. Today also happens to be the First Friday of the month. 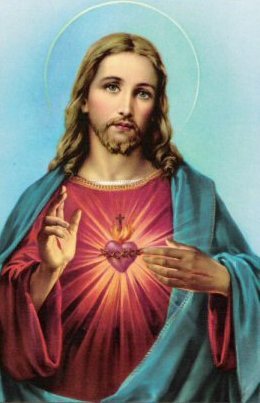 The first Friday of every month is set apart for devotion to the Sacred Heart of Jesus which includes making reparation for our sins. St. Margaret Mary Alacoque, a 17th century nun and mystic promoted the devotion to the Sacred Heart of Jesus. The heart of Jesus burns with love for us. Let us adore the Heart of Jesus present in all the tabernacles of the world. Let us turn to the Sacred Heart of Jesus, the fount of unfathomable divine mercy in reparation for our sins and those of the whole world. May the Heart of Jesus in the Most Blessed Sacrament be praised, adored and loved with grateful affection, at every moment, in all the tabernacles of the world, even to the End of Time! Amen. My Jesus, I trust in Thee! Sacred Heart of Jesus, I believe in Thy love for me!